So, on a day like this, who has the time to bother with a complicated meal. This is one of my favorites from my main spot, Wildflour. I am there so often, it's bordering on becoming an extension of my dining room. 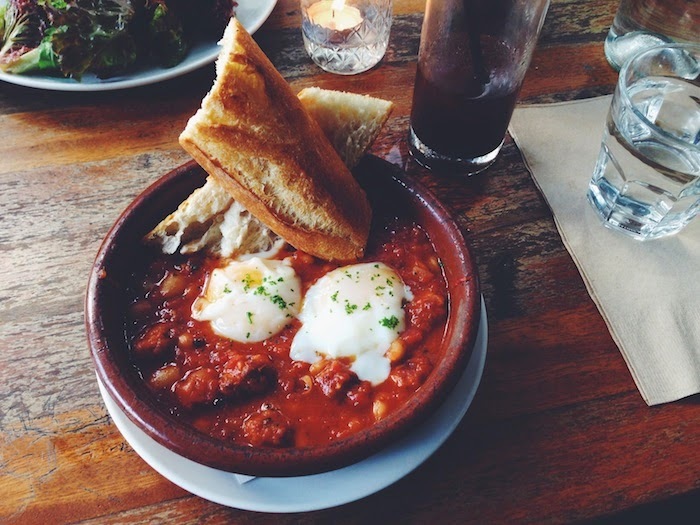 This dish is a total no-brainer - white beans in tomato sauce, chorizo, topped with two perfectly poached eggs with a side of bread. For the diet-conscious, skip the bread, but frankly, I think there is no better way of enjoying this dish than by adding a bucketload of cayenne pepper on it and then running bits of bread through it.